I totally forgot to mention that Emma has been going to the cradle roll class on Sunday mornings for 3 weeks now & she is doing really good. I know I waited a while before I took her but I wanted her to be able to sit in the seat by herself + I wanted her post up period to over before I took her too. Also they have been remodeling the church building & the class room wasn't set up until right before Memorial Day. Last night she went to Wednesday night class for the first time & guess who is the teacher, me. Its been a long time since I taught cradle role & Morgan came for the first time last night too. We had a great time. Emma started eating baby food over the weekend for the first time & she didn't really like it, or it may have been what I gave her. I fed her green beans & looking back on it now I probably should have started off with something like applesauce, but I didn't. 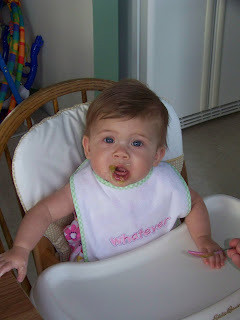 She never liked the green beans but she did better a few days later when she tried peaches. Today I gave her applesauce & she loved it. Emma is also close to waving & sitting up on her own. When you wave she will raise her arm with her hand open but her hand & fingers don't move yet. As for her sitting up, she does really good as long as she has her boppy to support her but occassionally still falls on her face. 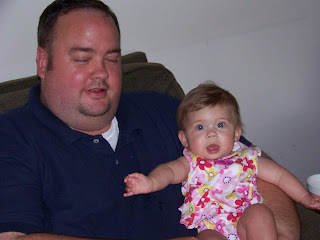 Here is Uncle Shawn holding Emma for the first time. Yes you read that correctly, the first time. He has been scared to hold her & he lives in the DC area so he isn't here but every few months. Look at this face. I am feeding her green beans & she doesn't like them at all. I am hoping she will warm up to them next time. Yeah I will probably give her squash for dinner. One of nurses told me to start off with veggies but I definately should have started with something else first. Live & learn.